I like using an envelope liner die too, but I started noticing how we open mail at our house. We use one of those envelope opener sharp things to slice through the top, then pull the mail out of the envelope. It occurred to me that I would be one of those people that a pretty envelope liner would be wasted on because I would never see it. I wondered how many other people open their mail that way, or worse yet, just rip across the top. So I don't use my liner die very much anymore. Sad, but true - they really do dress up an envelope. Wonderful card. I hope it brings great joy to its recipient, and also big bucks to you when you win the challenge! I agree with you about loving lined envelopes. I often do it when I am making a card set as a gift, but rarely for myself. Now, that's not right. Love the look of the gold embossing with autumn colours. I think, provided one only enters challenges that "fit", one can perfectly well preserve integrity and, if lucky, win :D. Good luck to you. What a perfectly delightful way to say 'welcome autumn' Joan! Your card is bright and simply beautiful! 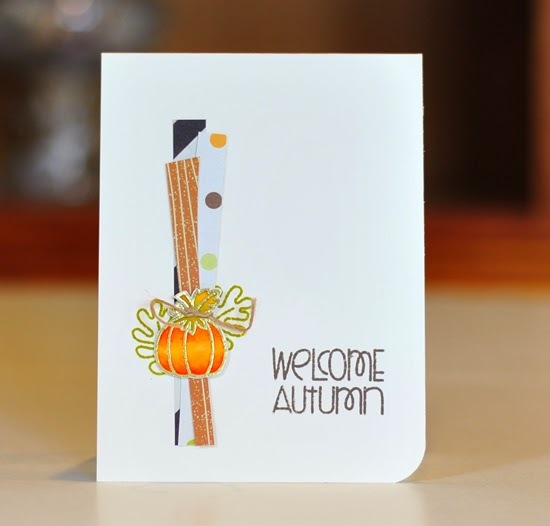 A perfect card for autumn - I love it! Fall is my favorite time of year!! Love the colors, the weather, everything, including this card!! CUTE! Need to remember the idea to use strips of paper like that! Well, now, this is one of my all-time favorites! 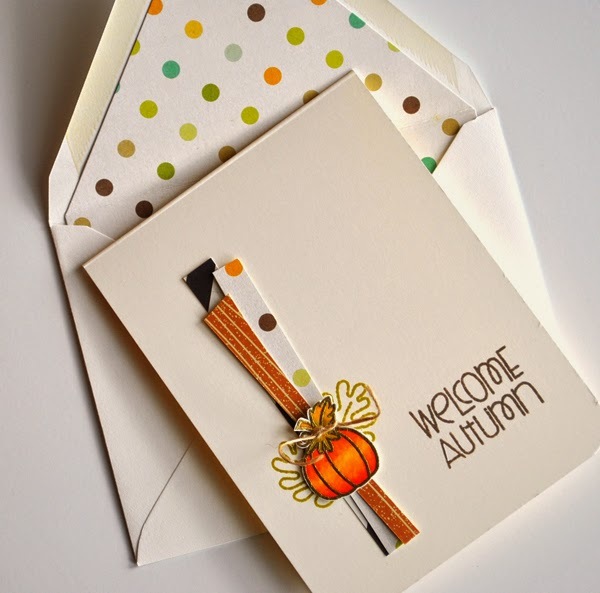 The bright pumpkin on those little sticks of designer paper, and the fun font on the sentiment -- LOVE! Beautiful fall card, and I love the matching envelope! Okay, I was on the fence about the envelope liner die, but you've convinced me! Me likey this card very much! Can we bring autumn back just so we can make more autumn cards? I find this one very inspiring!! !